Your department is looking for a drone? That is awesome because drones are now being used for traffic reconstructions, leading search and rescue missions, and monitoring crowds. They are making the work of officers more effective and much safer. Do you want to be able to do your job better, more effectively, and remain safe? Great! You have come to the right place. We have put together a quick guide to help you determine the right drone for your department! The first step in making your drone decision, is deciding whether you need a multi-rotor or a fixed wing drone. They are each going to have their own advantages and disadvantages, that make them specialized for certain uses. It is important to understand what your needs are, and what the differences between the types of drones are, to ultimately make the best decision when purchasing. Multi-rotor drones are the most popular type of drone. They are made up of one centralized body with several rotors that “carry” them. They are further classified by the number of rotors that are on the body. There are tri-copters (3 rotors), quadcopters (4 rotors), and even octocopters (8 rotors). However, quadcopters are going to be the most common, and most popular of the multirotors. Fixed wing drones consist of one rigid wing and typically a single propeller. Designed to look and work like an airplane, they are unable to hover and instead glide on a set path. They tend to be more efficient than multi-rotor drones, but are typically harder to learn to fly. This may be an important factor to consider. There are many things that influence the length of flight and battery life for a drone. The capacity of the battery, your flying conditions, and the weight of your drone can affect your battery’s life. Some factors are based on your use and care, but the capacity of the battery is something that you can look for when purchasing a drone. The higher the capacity (mAh) of your LiPo battery (suggested make of battery for drones), the longer battery life you may experience. NOTE: you should never exceed the maximum capacity (mAh) that your drone can support. Flying on a clear, still day is going to be easier on your battery rather than flying on a windy day. The wind is going to affect how hard your drone has to work, therefore draining your battery faster. Just as, if the payload (camera, gimbal, etc…) on your drone is heavier, your battery is going to drain faster. Check out our 9 Tips to Improve Drone Flight Times, to see how you can increase your battery life and flight times. 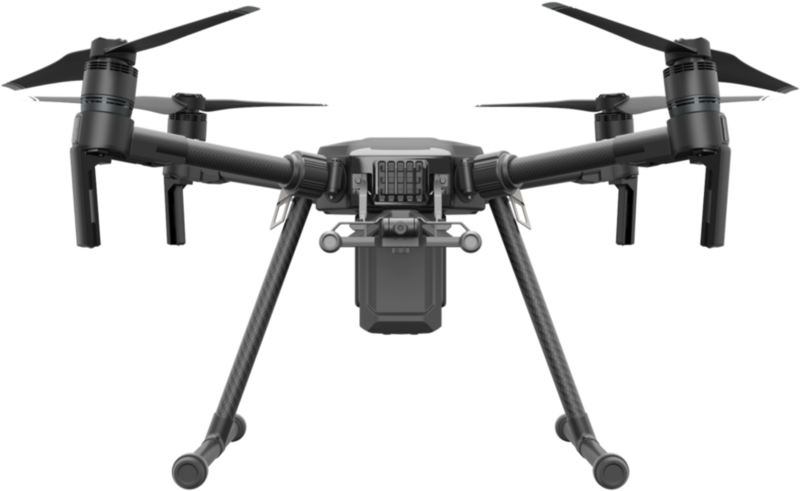 DJI™ 's Zenmuse XT is powered by FLIR, and has seamless integration in many DJI™ drones. It allows agencies to lead search and rescue missions, identify persons and things of interest, and detect hazardous areas. Image from dji.com/zenmuse-xt. Another thing to consider when determining what drone is right for you, is the camera. Most drones today come with a Red, Green, Blue (RGB) camera. These are standard cameras that come in a variety of qualities and resolutions. Many of the standard RGB cameras meet industry needs, and take quality images for both 2D and 3D maps. If you decide you want more than the standard camera, and your chosen drone has the capability to swap cameras, you may want to consider a thermal or thermographic camera. These cameras detect infrared radiation from the electromagnetic spectrum. A thermal camera can help locate individuals by detecting their body heat, determining if there are any potential threats (animals, individuals, harmful substances, etc…) in a specific area, or recreate a traffic accident based on the friction patterns caused by the tires involved. Having a thermal camera increases officer safety, efficiency, and accuracy in the field. They are definitely something that needs to be considered. Considering your end budget of what you are willing and able to spend is going to be important. Not only do you need to consider the price of each drone, but what it may cost to purchase additional batteries, software to analyze your data captured, and the costs to become a certified pilot under Part 107 (if you haven’t done so already.) Ultimately, you want to find a drone whose total investment doesn’t exceed your budget. Note: There are several grants out there that may be able to help pay for your UAV program. Begin your search here. Are you a first-time drone pilot? Have you flown a toy drone before, but not one for professional use? Or have you been flying for years, and are just in the market for a new drone? All experience levels are welcomed to the drone community! However, depending on your experience level, there may be certain drones that better suit your experience. Either way, there are a multitude of training course and sites available to the drone community to help get you into the air (successfully)! DroneU: Training site designed to make flying a drone, starting a drone business, or achieving your drone dreams easier. They provide daily drone-related podcasts, online training courses, downloadable resources, and the opportunity to become a part of a larger drone community. DartDrones: A leader in drone training, consultation, and expert support for new drone pilots. They provide customized training, specific to industries and their needs. As well as, both in-person and online training courses. Fun Fact: You may have seen them on an episode of Shark Tank! UAV Coach: Online drone training site that prepares pilots for flight and sets them up for success. They offer online training courses that assist in building skill sets, and getting a pilot certified. Check out their Drone Pilot Ground School, when preparing to take the FAA knowledge exam. They also provide free resource guides, industry news, and a community forum to help you connect with other drone pilots around the world. Now that you have an idea of what you need and what you are looking for, you can begin deciding what drone to purchase. Our pilot, Will, has created Good, Better, and Best lists of suggested drones for law enforcement. If you have any questions or are interested in any of the drones, contact us! Botlink was founded in Fargo, North Dakota, by experienced military pilots and engineers dedicated to safely sharing the benefits of drones with commercial users on a highly accessible and user-friendly custom-designed app. Botlink provides an automated drone software solution designed to help key industry members use drones to make their jobs easier, safer, and more productive. It combines flight planning, high-definition imagery, data processing, and analysis to ensure the best user experience and return on investment. Quickly and safely capture data using drones, distribute that data to trade tools and react to changing conditions in real time. Where Can (And Can’t) You Fly a Drone?